This engaging book not only offers step-by-step guidance on planning, writing, and defending a dissertation but also helps create a beginning-to-end process that is meaningful, rewarding, and exciting. Each chapter answers commonly asked questions, contains a checklist for each part of the dissertation, provides a summary of key points, and lists additional resources. Topics addressed include tips for staying motivated, time management, and self-care; selecting a dissertation committee and narrowing down the topic; writing a proposal; preparing the literature review; creating the problem statement, purpose statement, and research questions; understanding research methodology and ethics; collecting and analyzing data; presenting results; and best of all—publishing a dissertation. Brandé Flames, PhD, NCC, LPC is a licensed professional counselor and clinical professor in the Counseling and Special Populations department at Lamar University. She is also the CEO and Founder of the nonprofit Serving and Learning Together (SALT) world Inc., which provides volunteer services to developing countries. A. Stephen Lenz is the author of A Counselor's Guide to the Dissertation Process: Where to Start and How to Finish, published by Wiley. Richard S. Balkin, Ph.D., LPCC, NCC is a Professor and Doctoral Program Coordinator at the University of Louisville. Dr. Balkin is a Fellow of the American Counseling Association, the editor for the Journal of Counseling and Development, the flagship journal for the American Counseling Association, and past president for the Association for Assessment and Research in Counseling. Dr. Balkin has over 65 publications, which include textbooks, published tests and technical manuals. 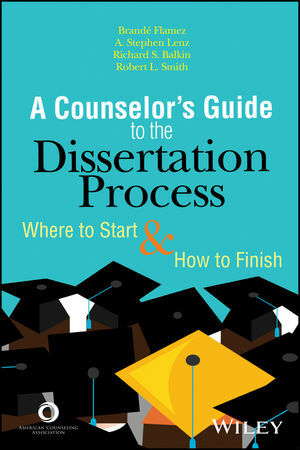 Robert L. Smith is the author of A Counselor's Guide to the Dissertation Process: Where to Start and How to Finish, published by Wiley.